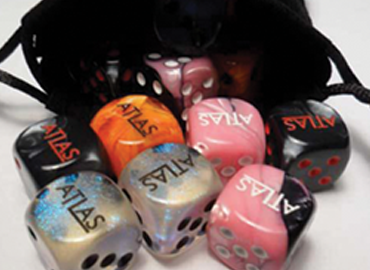 Our 3/4" Loaded Dice are weighted to feature you company logo on every roll. Pricing shown with 3/4" transparent dice in our 3 x 4 velvet dice bag. Please contact us for pricing on other options! Our Dice Pairs in Velvet-Style Bags are available with 5/8", 3/4", and 1" Opaque or Transparent Regular Custom Dice in a range of colors, including White Dice, Red Dice, Blue Dice, Black Dice, Green Dice, and more. All our Custom Dice are available with any standard imprint color.